LAMP is an acronym of the names of its original four open-source components used for building dynamic websites and web applications, These components are Linux, Apache, MySQL and PHP (or Perl). The equivalent installation on Microsoft Windows operating system is known as WAMP. 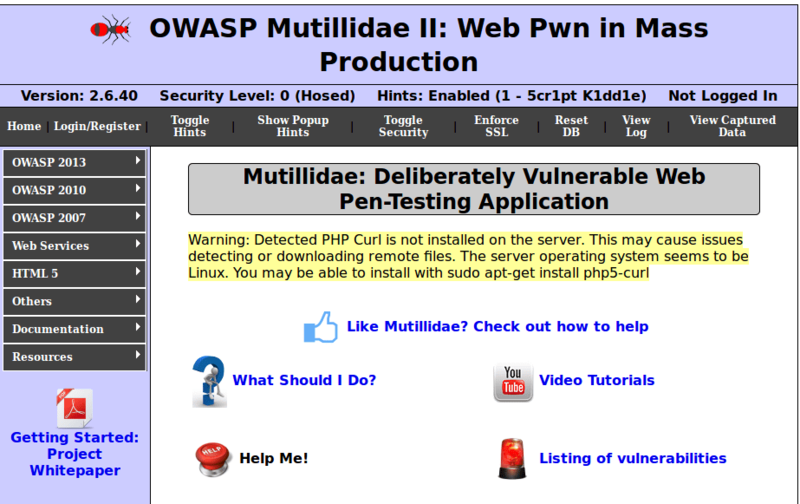 To make this server vulnerable, we will be installing outdated versions of PHP and setting up broken web applications, these applications are used for learning how to hack\pentest using various different methods. Be careful not to expose your vulnerable LAMP server outside your own network as it will be hacked. I will be setting up my vulnerable LAMP server in Linux Mint which I installed recently, See my Installing Linux Mint in VirtualBox Tutorial here . But this tutorial should work with most debian\Ubuntu based Linux Distributions. Before we start let’s update all the repositories and upgrade our Linux installation. 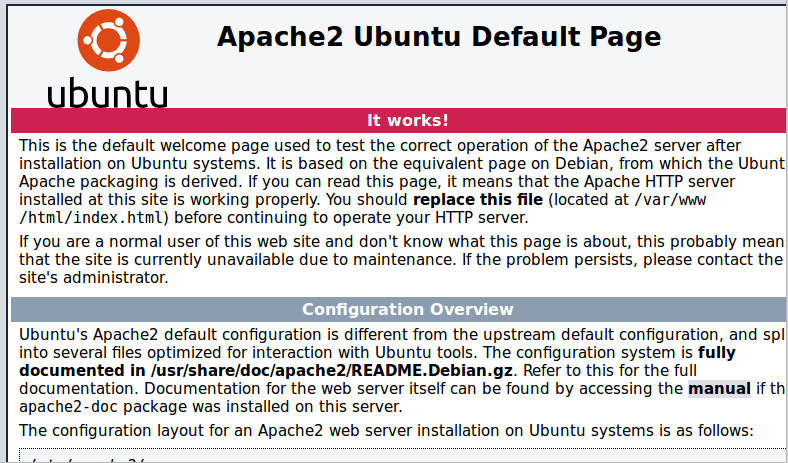 First, we will be installing Apache HTTP server this is simply done by typing this command below. To test its all working, just open up a web browser and type either http://127.0.0.1 or http://localhost and you should be presented with a page like this. 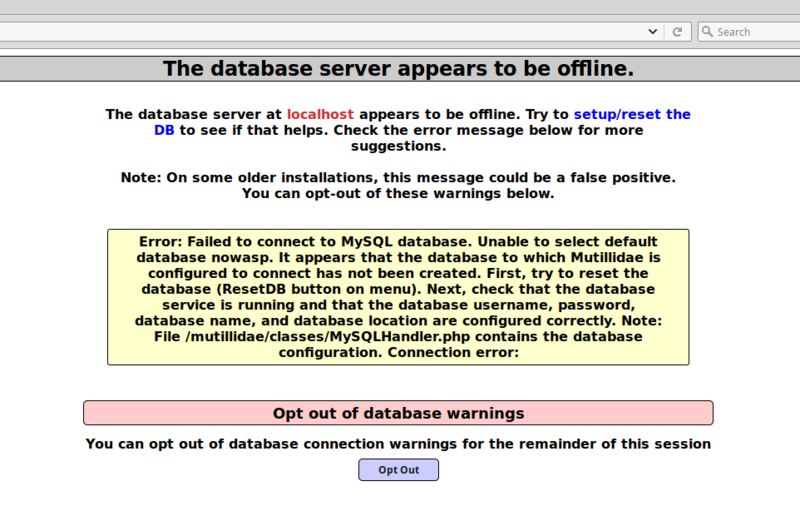 Now its time to install MySQL Database, this is done by typing. This will start the installer and then ask if you want to continue, hit Y and enter and it should start installing. Then you will be asked to set a Password for MySQL, as this is a vulnerable Server we are going to set the password to [email protected]. In the real world, you would use a password much more secure. The latest version of PHP is version 7 but as this a vulnerable server we will need Version 5.6 to make sure the vulnerable sites we will be setting up later work properly, but the only version in the Mint repositories is the latest version 7. 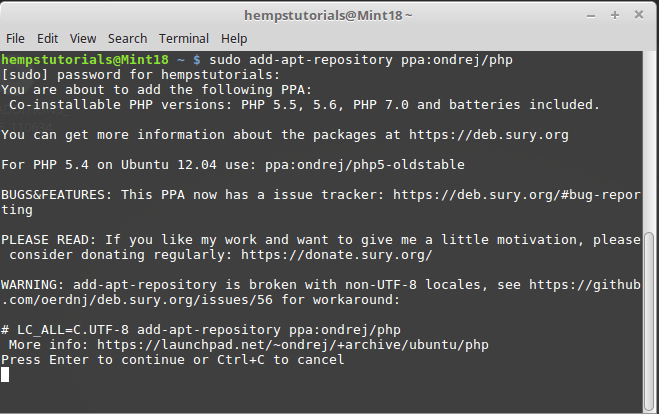 To get around this we need to edit the repository list to install a older version of PHP. Press enter to continue and the repository will install. Now we will need to update our newly installed repositories. Check if you have a version of PHP already installed. now install PHP5.6 from our updated repository. just to make sure everything has installed correctly type php -v and check the version. Next, we are going to create a PHP info page that will show PHP is Setup correctly. Then using a text editor we can create our phpinfo.php file. when nano opens up our blank php file type..
…and press ctrl x to exit and it will ask you if you want to save your changes just hit y, check the file name and hit enter. and you should get presented with a page like this showing you all you PHP configurations. Go to the site (link above) and click their download link which should give you a prompt asking you what you want to do with the file just click Save File and click OK, this should save the file to your downloads folder. Open up a Terminal and we will need to navigate to where we downloaded DVWA. If you do a ls you should be able to see the file you already downloaded. Now unzip the DVWA zip file extract it into a folder called dvwa. Then move newly created dvwa folder to the apache directory. 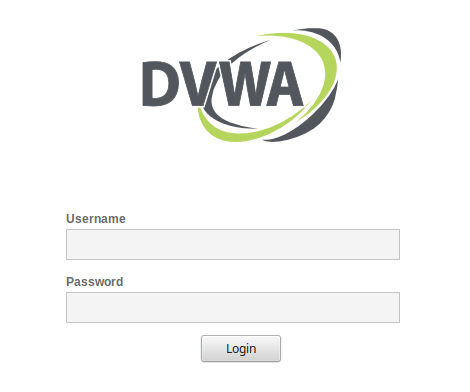 Next navigate to the dvwa config folder so we can enter in the MySQL details to get DVWA working. then use a text edititor to endit the config file. Anything highlighted in red needs to be dealt with before we create the databases. To set this we need to edit our php.ini file, so first navagate to the folder that contains the php.ini file. Then tap Ctrl + w to do a search, type allow_url_include. Hit CTRL+x to close nano and Y to save the changes we have just made. Reload the apache2 service to make the changes available. This can quite easly be installed from our linux reposatories. Go to https://www.google.com/recaptcha/ to create and generate your own keys for the Insecure CAPTCHA module. You will need to then login with a google account and select the big blue Get reCAPTCHA button. Then in the Register a new site box add a label, type dvwa and in the domains type localhost, 127.0.0.1 and click Register. You should now be given your Keys which we need to add into the config.inc.php in your DVWA folder. With a text editor open up the config document in the dvwa folder. Edit the ReCAPTCHA settings, adding in the keys we have just got from google inbetween the two ‘ ‘. Site key going into the recapture_public_key and Secret Key going into recaptcha_private_key. Then hit Ctrl+x to close and y to save the changes and reload the apache services. This Error means you need to make uploads a writable folder you use Chmod and chown to do this. same as above you need to use chmod to change the permissions on this file and make it writeable. 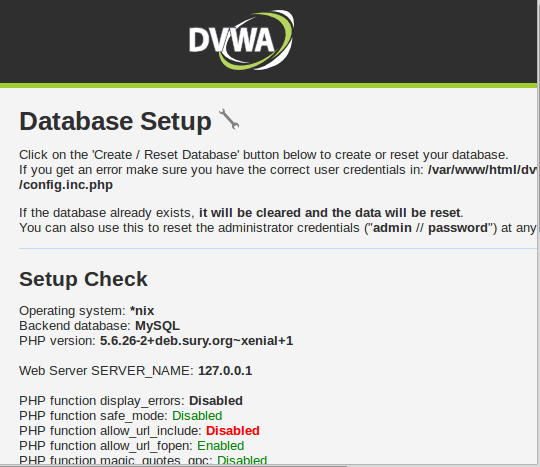 Now every thing should be green on our Database setup page, click Create / Reset Database button at the bottom of the DVWA setup window this will connect to MySQL and create all the required databases. and you should now get automatically presented with the login screen. The default username and password for this site is admin:password . Download the latest Mutillidae zip file from https://sourceforge.net/projects/mutillidae/files/mutillidae-project/ and save it to your downloads folder. navigate to your downloads directory. If you do a ls you should see something like LATEST-mutillidae-2.6.40.zip in this folder, we need to now unzip it. 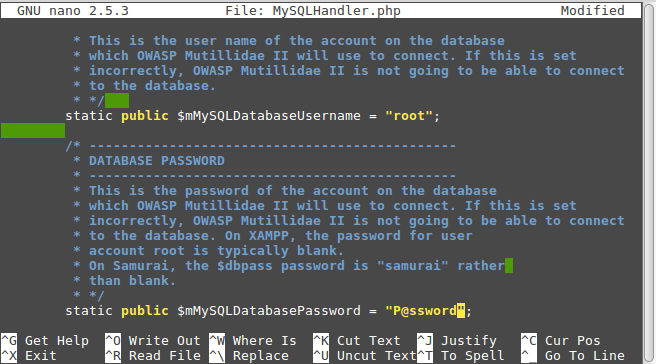 Now we need to setup the Mysql Password in the MySQLHandler.php file, so mutillidae can connect to MySQL and setup the databases. Scroll down the document until you find static public $mMySQLDatabasePassword = “”; and enter [email protected] between the speech marks” ” as below. Then hit Ctrl+x and then y to save changes. next we need to modify the apache directory config to add index.php to be first in the list. Hash (#) out the the current DirectoryIndex line and on a new line type out a new DirectoryIndex see below. Ctrl + x to exit the document and hit y and enter to save. Then you need to add php5.6-Simplexml from the Linux repositories this allows the server to easily manipulate and get XML data. Then reload the apache2 service. Now open up your web browser and in the address bar type http://127.0.0.1/mutillidae and you should get a message saying the database is offline. 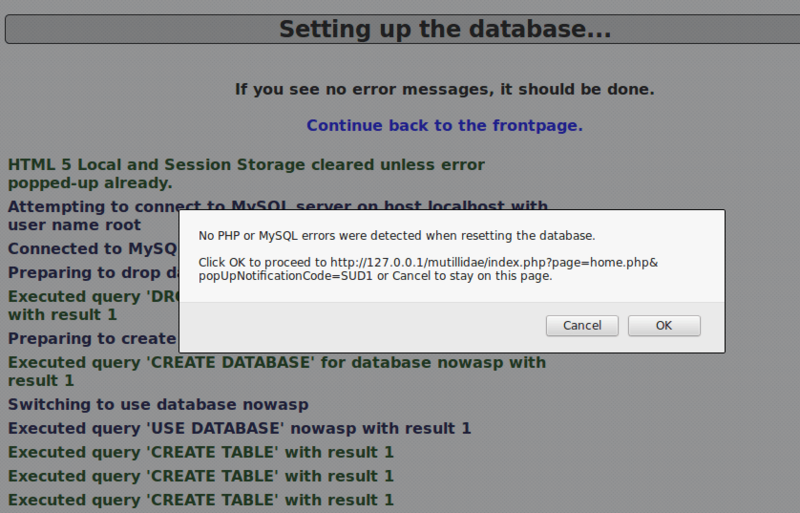 Click setup/reset the DB this should run through and setup all the database for you and you should get a pop-up saying No PHP or MySQL errors were detected when resetting the database. Click OK and the page should reload and you get redirected to the Mutillidae home page. Notice the Yellow warning message that says we don’t have php5-curl installed so open up a terminal and type. If you reload the mutillidae page, we should see the error has gone away. Download Sqli-labs by following this link http://github.com/Audi-1/sqli-labs/archive/master.zip and saving it to you downloads directory. if you do a ls you should see sqli-labs-master.zip in this folder now we need to unzip the folder. 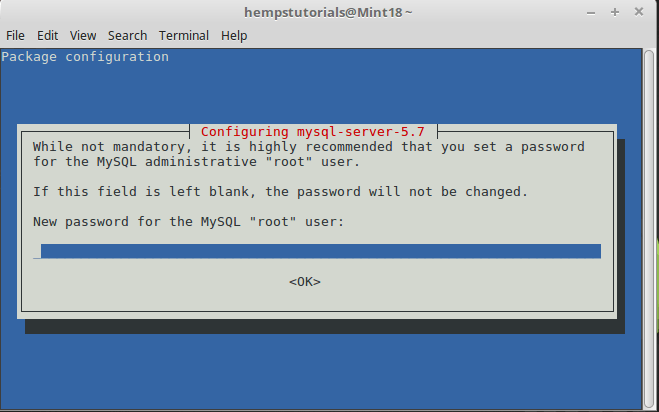 next we need add the Mysql password to the database configuration file . then Ctrl + x to exit and hit y and enter to save. In your web browser navigate to your sqli folder and you should get a page as below. 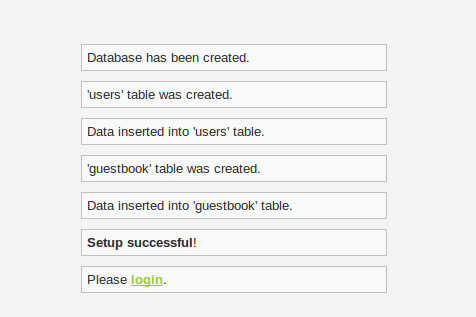 Lastly, click Setup/reset Database for labs this will create all the databases needed. Save the file to your Downloads folder then navagate to your downloads folder. type ls just to check bWAPPv2.2.zip is in your Downloads folder and we can now unzip it. Now move the folder to your apache directory. 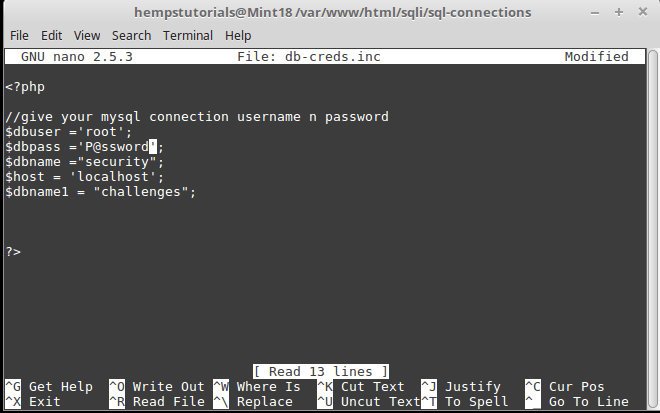 navigate to the part of the document that says // Database connection settings and add the MySQL password between the speech marks on db_password = “[email protected]”; as below. press Ctrl + x to exit settings.php and hit y to save the file. cd .. to go back one directory and we need to change some permissions to make the application Vulnerable. 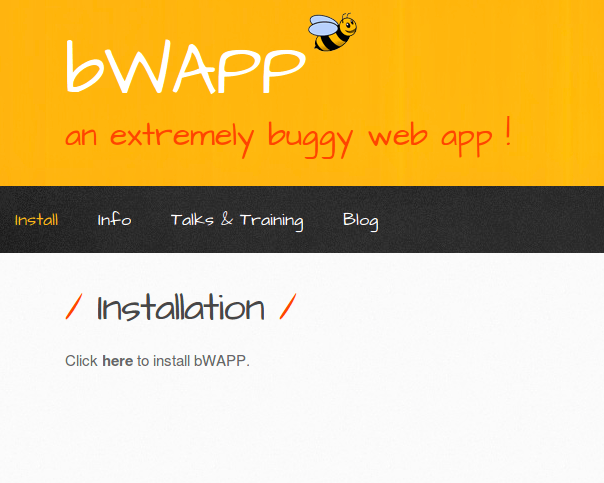 you should see the bWAPP install page, just click the here to install bWAPP link. 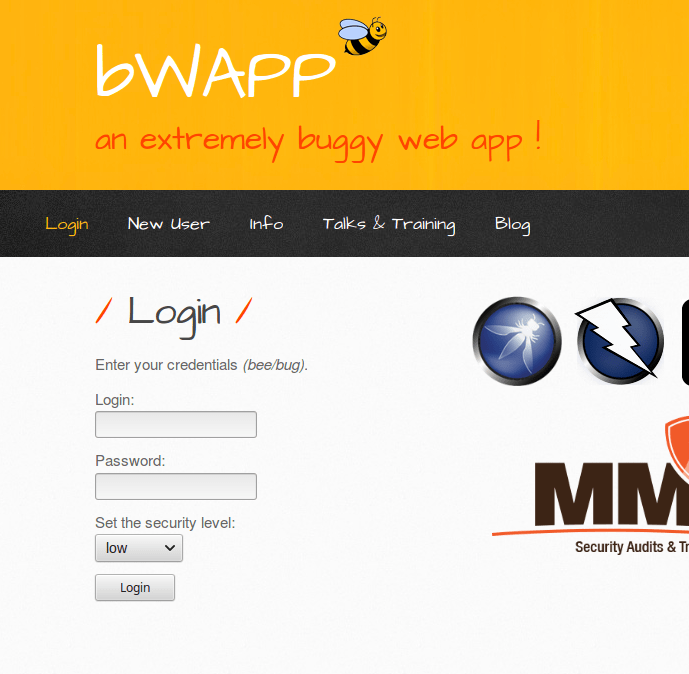 This will quickly setup all the databases and the screen will display bWAPP has been installed sucessfully! and thats our vulnerable Server all setup, I will be useing this setup for future tutorials, so keep checking back as i have some exciting things planned and as always please comment in the Reply box below if you have any issues setting this up or have any comments for me. Great article I was really having issues getting this setup. Thanks for your comments gives me a real boost to continue writing more tutorials … enjoy your vulnerable LAMP server. This article is very useful for me :-). while i was installing mutillidae, i stuck. Now i am clear. How do install/setup complete lap setup. Thanks for the comment Karthikeyan, keep coming back, there is some more exciting tutorials in the pipeline. This article is very helpful to me. I really love u who have made this article. Thanks for the comment Hardiansyah glad you found my blog useful. Thanks a ton Hemp ! My hours of struggle finally got a solution from your blog ! Everything is crisp & guided very well. Glad i was able to help, have fun attacking your new vulnerable LAMP server. Nice tutorial you’ve got there. I have downloaded buggy app but never had the time and the knowledge to properly installed it, got it configured and running. Hi MiNDTH3G4p thanks for your comment, I had the same issues when I was starting out and that’s exactly the reason I made this blog post. bWAPP team also do a Pre-built virtual machine called the bee-box which is a custom Linux image that you should have no problems adding into something like VirtualBox.